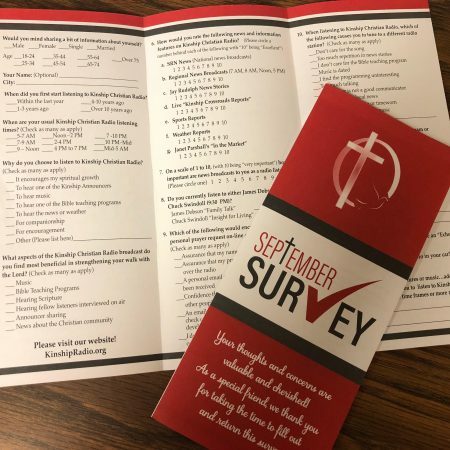 Kinship Christian Radio | It’s September Survey Time! 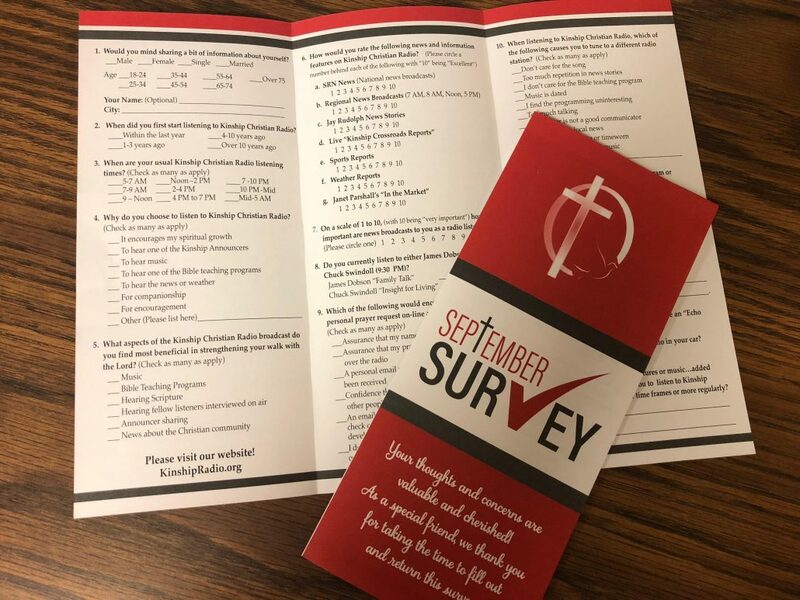 As a listener of Kinship Christian Radio, your opinion of the ministry is always valuable, but in September, you are encouraged to share it more than ever! All of the surveys have already been mailed out, so if you have not received one by now, you can obtain one by calling 800-810-5559. Your opinions, input, advice, and preferences will be used to make the ministry of Kinship Christian Radio better meet your needs, the needs of the others, and to bring glory to God! HALLELUJAH! I have been listening for over ten years. Yes, I have a “try not to miss it” type program or feature. (Steve and Allen’s conversations at 7:36 a.m. each weekday morning. Oh, and Beth Crosby’s “Wings of Worship” is also very good, and I really like “Creation Moments” at 7:45 weekday mornings, and that Scottish preacher (Alistair Begg) in the evenings, oh and Ravi Zacharias on Sunday (Let My People Think) and, (even though I’m usually in church) the one Matt Dorfner does on Sundays at 10:00 a.m.) Oh, and I almost forgot about Mission Network News. I really like that. So fill out you survey and return it as soon as possible! They really do want to know what you think! https://kinshipradio.org/home/wp-content/uploads/2018/09/survey.jpg 3024 4032 Dan Jones https://kinshipradio.org/home/wp-content/uploads/2016/09/kinship-long-logo-blue.png Dan Jones2018-09-05 23:49:342018-09-05 23:49:34It's September Survey Time! I appreciate your programs. I listen on my drive to work around 6 a.m. and feel energized and uplifted starting my day. I enjoy listening to the late afternoon comments my drive home around 5 p.m. I love the songs and the speakers. For me, my experience listening to your station has been healing and informative. Thank U.
Debora, Thank you for you kind words. We are so thankful that Kinship Christian Radio helps you in your daily walk with the Lord.